Physical abuse is any intentional act causing injury or trauma to another person or animal by way of bodily contact. In most cases, children are the victims of physical abuse, but adults can also be victims, as in cases of domestic violence or workplace aggression. Alternative terms sometimes used include physical assault or physical violence, and may also include sexual abuse. Physical abuse may involve more than one abuser, and more than one victim. Physical abuse means any non-accidental act or behavior causing injury, trauma, or other physical suffering or bodily harm. Abusive acts toward children can often result from parents' attempts at child discipline through excessive corporal punishment. many abusive and neglectful parents have had little exposure to positive parental models and supports. there is often a greater degree of stress in the family environment. information-processing disturbances may cause maltreating parents to misperceive or mislabel their child's behavior, which leads to inappropriate responses. there is often a lack of awareness or understanding of developmentally appropriate expectations. Researchers have pointed to other potential psycho-biological effects of child physical abuse on parenting, when abused children become adults. These recent findings may, at least in part, be carried forward by epigenetic changes that impact the regulation of stress physiology. Many other potentially important consequences of childhood physical abuse on adolescent and adult physical and mental health and development have been documented via the Adverse Childhood Experiences (ACE) studies. Seeking treatment is unlikely for a majority of people that are physically abused, and the ones who are seeking treatment are usually under some form of legal constraint. The prevention and treatment options for physically abused children include: enhancing positive experiences early in the development of the parent-child relationship, as well as changing how parents teach, discipline, and attend to their children. Evidence-based interventions include cognitive behavioral therapy (CBT) as well as video-feedback interventions and child-parent psychodynamic psychotherapy; all of which specifically target anger patterns and distorted beliefs, and offer training and/or reflection, support, and modelling that focuses on parenting skills and expectations, as well as increasing empathy for the child by supporting the parent's taking the child's perspective. These forms of treatment may include training in social competence and management of daily demands in an effort to decrease parental stress, which is a known risk factor for physical abuse. Although these treatment and prevention strategies are to help children and parents of children who have been abused, some of these methods can also be applied to adults who have physically abused. Physical abuse has been described among Adélie penguins in Antarctica. 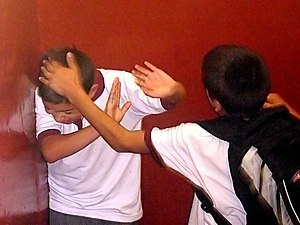 ^ "Child physical abuse". American Humane Association. ^ Giardino, A.P. ; Giardino, E.R. (12 December 2008). "Child Abuse & Neglect: Physical Abuse". WebMD. ^ a b c Mash, Eric (2010). Abnormal Child Psychology. Belmont, California: Wadsworth Cengage Learning. pp. 427–463. ISBN 9780495506270. ^ Oliver JE (1993). Intergenerational transmission of child abuse: rates, research, and clinical implications. Am J Psychiatry, 150(99): 1314-24. ^ Weder N, Zhang H, Jensen K, Yang BZ, Simen A, Jackowski A, Lipschitz D, Douglas-Palumberi H, Ge M, Perepletchikova F, O'Loughlin K, Hudziak JJ, Gelernter J, Kaufman J (2014). Child abuse, depression, and methylation in genes involved with stress, neural plasticity, and brain circuitry. J Am Acad Child Adolesc Psychiatry,53(4):417-24.e5. doi: 10.1016/j.jaac.2013.12.025. ^ Hillis SD, Anda RF, Dube SR, Felitti VJ, Marchbanks PA, Marks JS (2004). The association between adverse childhood experiences and adolescent pregnancy, long-term psychosocial consequences, and fetal death. Pediatrics. 2004 Feb;113(2):320-7. ^ Kolko, D. J. (1996). Individual cognitive-behavioral treatment and family therapy for physically abused children and their offending parents: A comparison of clinical outcomes. Child Maltreatment, 1, 322-342. ^ Schechter DS, Myers MM, Brunelli SA, Coates SW, Zeanah CH, Davies M, Grienenberger JF, Marshall RD, McCaw JE, Trabka KA, Liebowitz MR (2006). Traumatized mothers can change their minds about their toddlers: Understanding how a novel use of videofeedback supports positive change of maternal attributions. Infant Mental Health Journal, 27(5), 429-448. ^ Lieberman, A.F. (2007). "Ghosts and angels: Intergenerational patterns in the transmission and treatment of the traumatic sequelae of domestic violence". Infant Mental Health Journal. 28 (4): 422–439. doi:10.1002/imhj.20145. PMID 28640404. ^ McKie, Robin (9 June 2012). "'Sexual depravity' of penguins that Antarctic scientist dared not reveal". Guardian.co.uk.